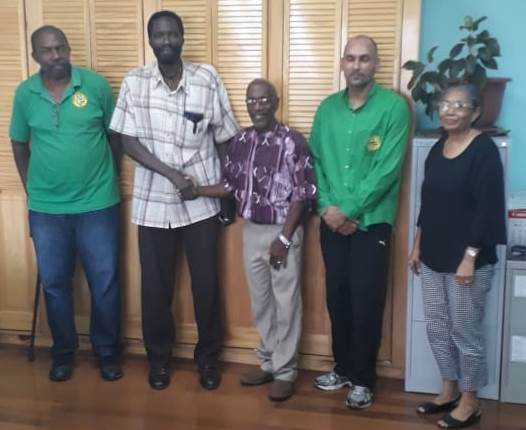 The University of Guyana (UG) and the United Minibus Union-UG Turkeyen Branch (UMU-UGTB) recently signed a three-year agreement for the Union to provide a mini bus service for staffers and students who commute to and from Georgetown and the East Coast of Demerara. The agreement was signed by Registrar of the University Dr Nigel Gravesande and President of the United Minibus Union Mr Eon Andrews. The agreement caters for the provision of the bus service by the 47 registered Route 44 bus drivers who ply the Georgetown/Turkeyen route, from 7:00 h to 21:30 h, Monday to Friday, and 7:00 h to 18:30 h on Saturdays. The current fare for that route is $120.00 per person. While the drivers who ply the Turkeyen to Mahaica route will operate from 16:30 h to 21:30 h from Monday to Friday. The current national fare structure applies for villages along that route. Additionally, the UG-sticker must be prominently displayed on each bus and both drivers and conductors are required to wear the t-shirts and caps provided by the Union and adhere to the Code of Conduct agreed to by both parties at the signing. Meanwhile, buses not registered with the UMU-UGTB will be restricted from entering the campus “for the purpose of being a transportation provider on the routes specified”.